Stepper motors is a brushless DC motor that rotates in discrete steps, and are the best choice for many precision motion control applications. Also, stepper motors are good for positioning, speed control and applications which require high torque at low speed. In previous tutorials of MATLAB, we have explained that how to use MATLAB to control DC motor, Servo motor and Home appliances. Today we will learn how to control Stepper Motor using MATALB and Arduino. If you are new to MATLAB then it is recommend to get started with simple LED blink program with MATLAB. Hence, it is your choice to program your stepper motor in any mode, but I prefer Two Phase-on stepping Full Step Mode. Because this method deliver faster speed then the one phase method and in compare to half mode the coding part is less due to less number of steps in two-phase method. To resize or to change the shape of the button, just click on it and you will be able to drag the corners of the button. By double-clicking on toggle button you can change the color, string and tag of that particular button. We have customized two buttons as shown in below picture. You can customize the buttons as per your choice. Now when you save this, a code is generated in the Editor window of MATLAB. To code your Arduino for performing any task related to your project, you always have to edit this generated code. So below we have edited the MATLAB code. You can learn more about Command window, editor window etc in Getting started with MATLAB tutorial. Complete MATLAB code, for controlling Stepper motor, is given at the end of this project. Further we are including the GUI file (.fig) and code file(.m) here for download (right click on link then select 'Save link as...')), using which you can customize the buttons as per your requirement. Below are some tweaks we did for rotating the Stepper Motor clockwise and anticlockwise using two toggle buttons. Copy and paste the below code on line no. 74 to make sure that the Arduino is talking with MATLAB every time you run the m-file. When you scroll down, you will see that there are two functions created for both the Buttons in the GUI. Now write the code in both the functions according to the task you want to perform on click. In Clockwise button’s function, copy and paste the below code just before the end of the function to rotate the motor in clockwise direction. 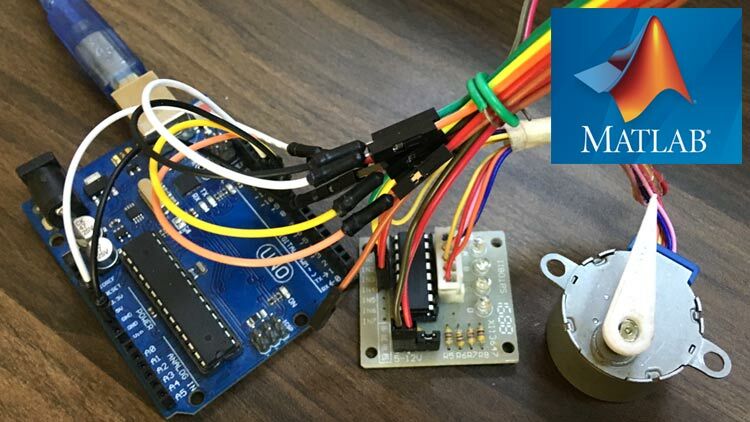 For continuously rotating the stepper motor in clockwise direction, we are using while loop to repeat the two phase-on stepping full mode steps for clockwise direction. Now in Anti-clockwise button’s function, paste the below code at the of the function to rotate the motor in anti-clockwise direction. For continuously rotating the stepper motor in anti-clockwise direction, we are using while loop to repeat the two phase-on stepping full mode steps for anti-clockwise direction. When everything is ready, click on clockwise or anticlockwise button to rotate the motor. As we are using toggle button, the stepper motor will continuously move in clockwise direction until we press the button again. Similarly, by pressing the anti-clockwise toggle button, motor starts rotating in anti-clockwise direction until we press the button again.